Broussard was born October 20th, 1916 and attended Mt. Carmel Elementary, graduating from Abbeville High School in 1934. He attended LSU and earned a Bachelor of Science degree in Vocational Agricultural Education in 1940. While at LSU, he was a three-year member of the LSU Baseball Team. He returned to the states and married the late Marjorie Boudreaux in 1941 and taught Vocational Agriculture at Gueydan High School prior to the outbreak of World War II. Broussard joined the United States Marine Corps in 1942 and, after graduating from Officers' Candidate School in Quantico, Virginia, he received the rank of Second Lieutenant. He served in combat in the Battle of Bouganville (an island in the southwest Pacific) where his Higgins Craft landing boat was hit and sunk by Japanese enemy fire. Luckily, they were in shallow water, or else all would have drowned. He continued to serve his country in the areas of American Somoa, New Zealand, Guadalcanal, New Caledonia and Mare Island, California. After his combat duty with the Marine Corps, he managed to have some fun and managed the USMC Baseball Team that was comprised of several major league players. He was honorably discharged in 1945 with the rank of Captain. After the war, in 1946, he established an automobile dealership, which would later come to be known as Broussard Pontiac Buick GMC Truck, Inc. in Abbeville. He acquired the Kaiser-Frazer franchise in 1946, Pontiac in 1948, GMC Truck in 1949, and Buick in 1957. His civic involvement in Vermilion Parish is as follows: American Legion Post Commander in 1946; Abbeville Rotary Club member since the 50's including service as past President. He was named a Paul Harris Fellow by Rotary International; a member of the Abbeville Chamber of Commerce, President in 1949; and chairman of the Board of the Abbeville Building and Loan Association. His political career included 8 years as a member of the Abbeville City Council member under the administration of J.E. Kibbe and Roy Theriot. Under the Kibbe administration he was Mayor Pro Temp handling the "Mayor's Court" prior to establishment of the elected office of City Judge. 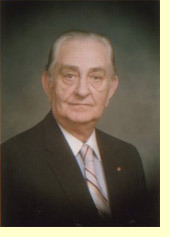 He was elected Mayor of Abbeville serving from 1962-1966. In 1964, the Louisiana Municipal Association nominated him for the honor of " Mayor of the Year ". He did not to seek a second term as mayor, even though he was unopposed, deciding instead to devote his energies to his automobile dealership. While Mayor of Abbeville, Broussard was instrumental in instituting Civil Service for city employees. He implemented a sales tax dedicated exclusively for Capital Improvements for the city and helped widen the streets of Abbeville. Under his administration, the "Central Fire Station" was built and new fire trucks were purchased. In his leisure time, he served as president of the Abbeville Athletic Baseball Association of the Evangeline League of Professional Baseball. He loved to coach youth baseball, while following his other hobbies of hunting and fishing. He has three daughters: Mrs. Paul (Dolores) Landry, Mrs. John T. (Sandra) Landry, and Mrs. Lloyd J. (Diane) Frederick, Jr., 8 grandchildren and 9 great-grandchildren.